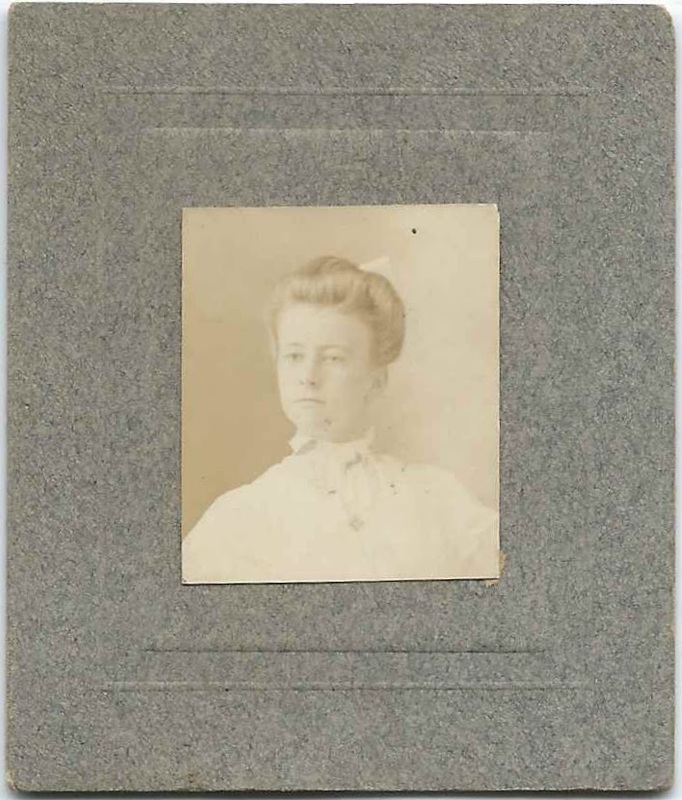 Photograph of a young woman identified on the reverse as Beatrice A. Saunders; taken by the Harry L. Plummer studio of Lewiston, Maine. 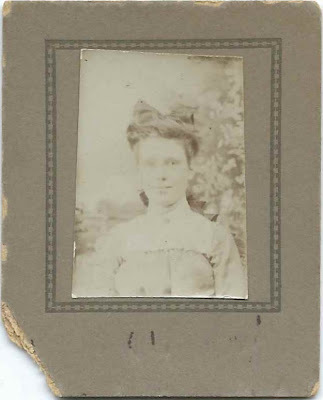 The young woman in the photograph may have been Beatrice Anna Saunders, born at Waterford, Maine, on September 5, 1891, daughter of Frederick Prescott Saunders and Harriet Abbie (Woodbury) Saunders. 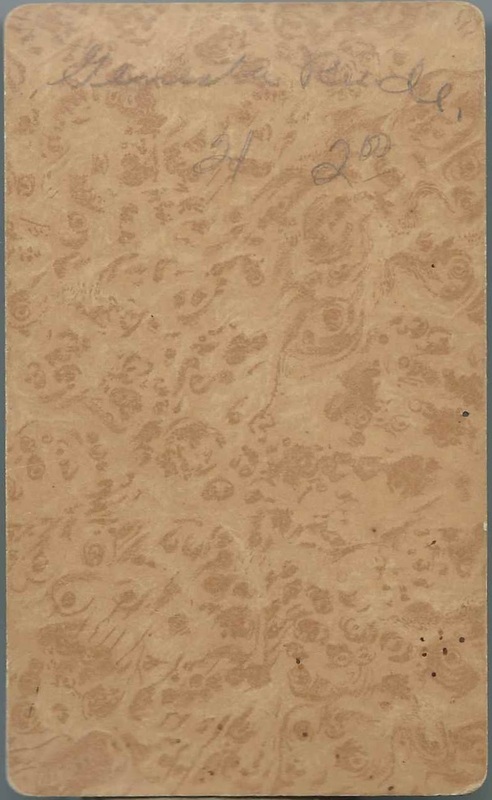 In the Censuses of 1920 of Bridgton, Maine, Beatrice is listed as living with her father and his second wife Isabel, who was Isabel was Isabel Agnew (Woodbury) Saunders, a sister to Harriet Abbie (Woodbury) Saunders, who had died in 1904. Beatrice was working as a nurse; perhaps she had received her training in the Lewiston area, accounting for having her photograph taken there. She received her nursing license on April 16, 1919, assuming that she is the Beatrice A. Young of Sweden Road, Bridgton, whose nursing license lapsed in 1973. By 1930, Beatrice was working as nurse and living in the household of her stepmother/aunt; her father had died in 1928. By 1940, she was still living with Isabel and working as the manager of a dowel mill. 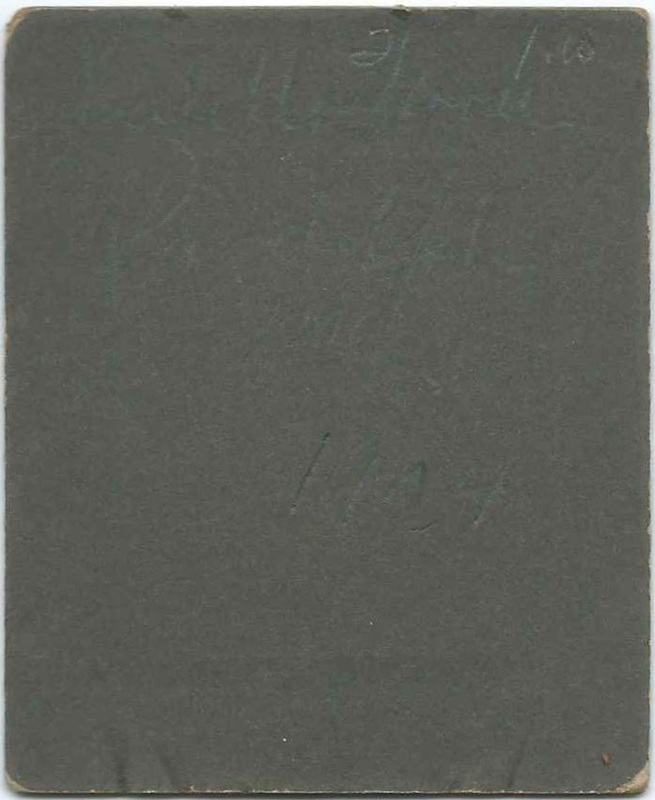 On May 23, 1945 at Bridgton, Maine, this Beatrice married photographer Oliver Pratt Young, son of Julian Francis Young and Mary Angeline (Pratt) Young. Oliver was born at Portland, Maine, on October 23, 1894 [another record shows October 24, 1894]. Beatrice and Oliver lived at Bridgton, Maine; I don't believe they had any children. Oliver was a member of the American Daffodil Society. Oliver died in 1964, and Beatrice in 1989. If you have corrections and/or additions to the information above, or if you believe the young woman to be another person, please leave a comment or contact me directly. 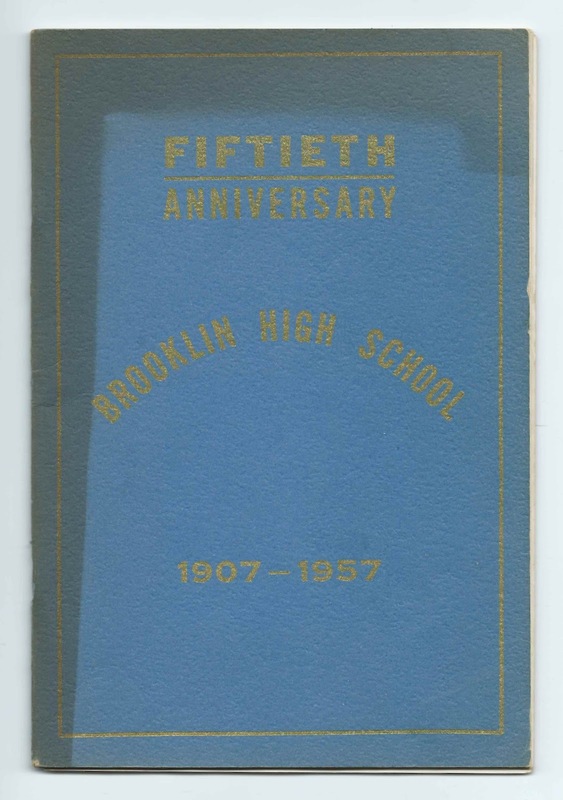 Fiftieth Anniversary of Brooklin High School, 1907-1957, formerly located at Brooklin, Maine. 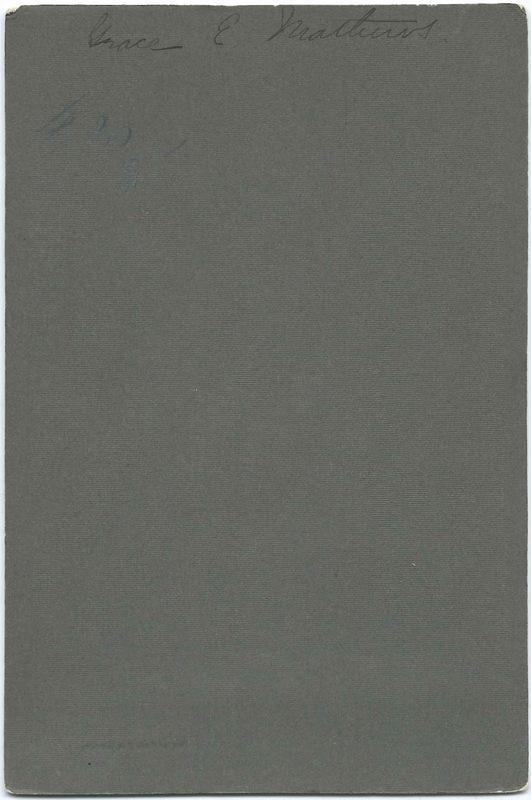 The booklet measures 9" by 6" and contains 45 numbered pages, as well as an end paper, perhaps designed for autographs or notes, in the back. 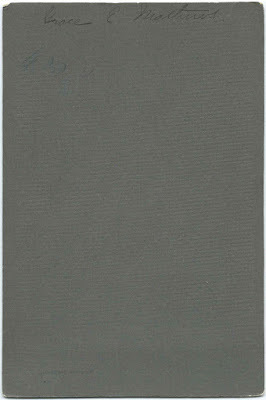 It was printed by the Hancock County Publishing Company of Ellsworth, Maine. Contained within are photographs of several people and views of Brooklin High School's three buildings over time; a history; selections from school publications over the years; and 343 names of founders, principals, instructors and graduates from 1907 to 1956. 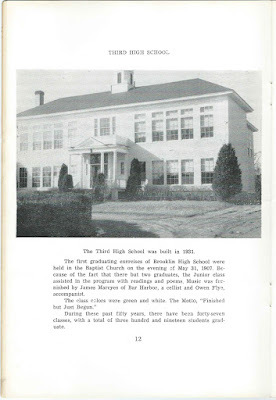 Below, a history and a photograph of the first Brooklin High School building, which burned in 1916. Click on any image to enlarge it. If you have stories to share about any of the people mentioned above, please leave a comment or contact me directly. 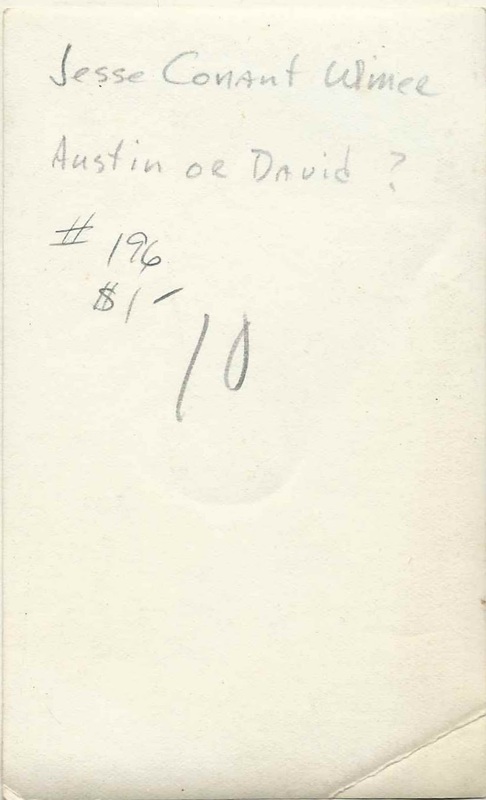 c1930 snapshot of a woman and child identified on the reverse as "Jesse Conant Ulmer" and "Austin or David". 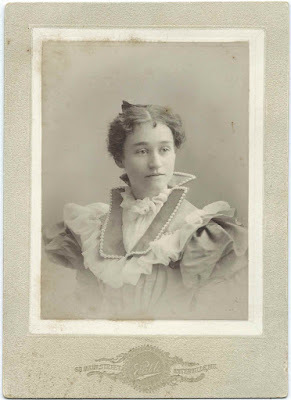 She was Jessie (Conant) Ulmer of Rockland, Maine, wife of Henry Eliot Ulmer. Jessie Louise (Conant) Ulmer was born December 8, 1904 at Rockland, Maine, the daughter of Ralph Philbrick Conant and Ella Mabel (Wixson) Conant. On June 19, 1926 at Rockland, Jessie married Henry Eliot Ulmer, son of Isaac Brown Ulmer and Isabella (Henry) Ulmer. Henry was born at Hampden, Maine, on July 18, 1902. By the time of the 1930 Census, Henry, Jessie and their three year old son were living at Vassalboro, Maine, where Henry was working as a missionary. Henry, a Baptist minister, later suffered legal issues and a breakdown and by 1940 was living at the Bangor State Hospital. In 1940, Jessie was teaching school and living in her parents' home at Rockland, Maine, with her two sons. Jessie died at Rockland, Maine, in 1987 and Henry at Severn, Maryland, in 1996. 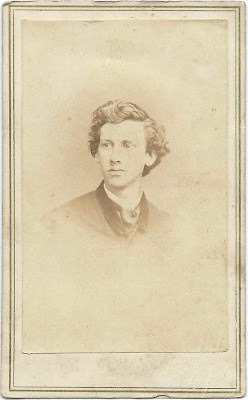 1860s carte de visite, or CDV, of David Crooker Plumstead, taken by the A. Jewett studio of Washington, D.C., presumably while Plumstead was serving as a musician in Massachusetts regiments during the Civil War. 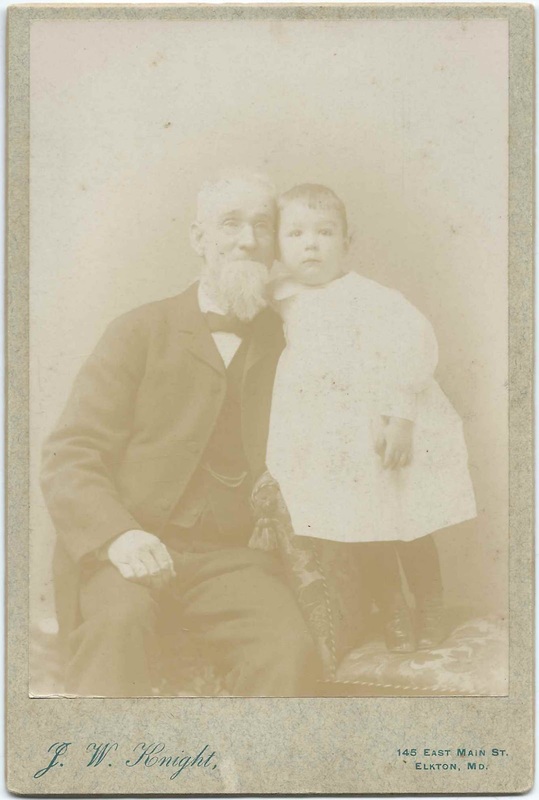 David C. Plumstead was born October 26, 1843 at Lynn, Massachusetts, the son of Matthew Buscall Plumstead and Martha Ellen (Crooker) Plumstead. 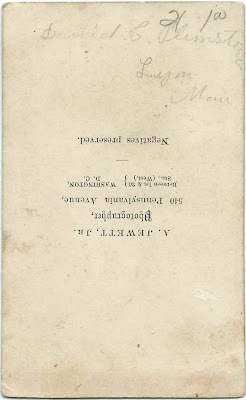 David, at the time working as a harness maker, enlisted in Company D of the Massachusetts 8th Infantry Regiment on September 13, 1862 at Lynn, Massachusetts and enlisted at least two additional times, so that he served through much of the War and a couple months beyond. After the War, David returned to Lynn, Massachusetts, to work again as a harness maker in the family business, M. Plumstead & Sons. In an 1882 Lynn city directory, the year before his death, David is shown as boarding at 32 Cambridge Street and still working in the family business, located at 131 Broad Street. David died of phthisis, or wasting away, possibly as a result of tuberculosis, on February 7, 1883 and is buried in Pine Grove Cemetery at Lynn, Massachusetts. I didn't find record of any marriages for him. Circa 1885 cabinet photograph of a young man identified on the reverse as Frank Rodrigue. The photograph was taken by the Renouf Studio of Biddeford, Maine. 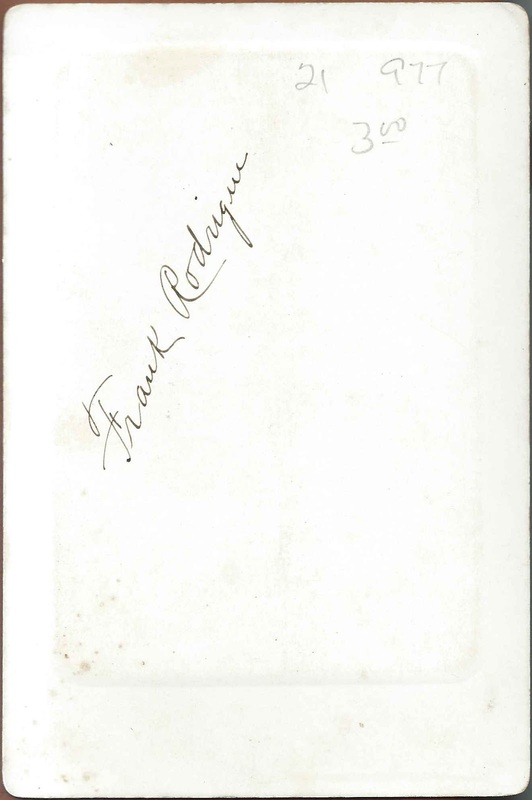 Presumably Frank Rodrigue is the Frank Rodrigue born June 8, 1866 at St. Francois de Beauceville, Quebec, who became a naturalized U.S. citizen on August 30, 1890, while he was living at Biddeford, Maine. This Frank had first arrived in the United States at Skowhegan, Maine, on April 10, 1883, presumably following the "Canada Road" [more information at the Old Canada Road Historical Society]. 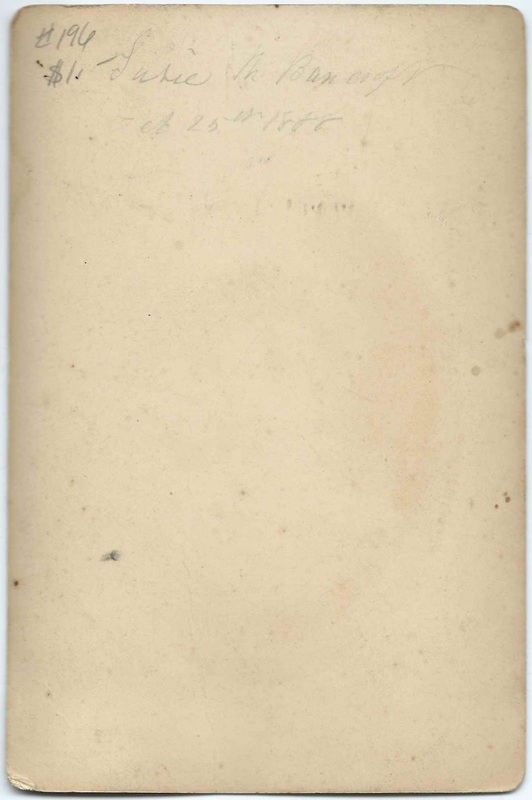 Witnesses on his naturalization form were Charles Rodrigue; Joseph Rodrigue; and H. I. Lord. Were Charles Rodrigue and Joseph Rodrigue brothers or cousins to Frank? If you have further information on the Frank Rodrigue described, or if you believe Frank was another person, please leave a comment or contact me directly. Cabinet photograph of a child and an elderly man identified on the reverse as "Uncle Henry Warner". The photograph was taken by the J. W. Knight studio of 145 East Maine Street, Elkton, Maryland. I found several possibilities for Henry Warner in the area of Elkton, which is near the borders of Pennsylvania and Delaware. If you have a theory as to which Henry Warner he was, please leave a comment or contact me directly. 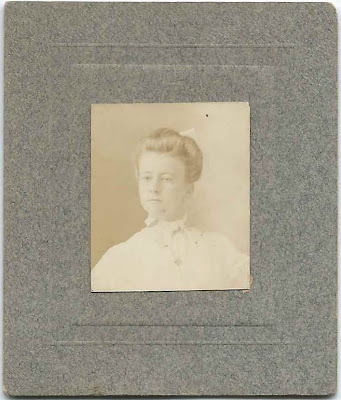 Cabinet photograph of a young woman identified on the reverse as Grace E. Mathews. The photograph was taken by the Randall studio of New Haven, Connecticut. 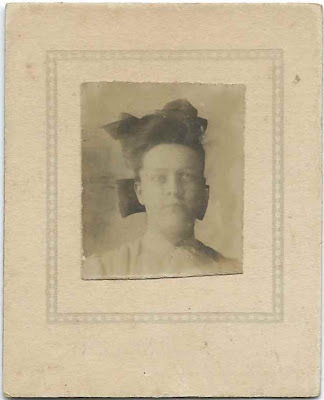 If you recognize Grace from your family photographs or research, please leave a comment or contact me directly. 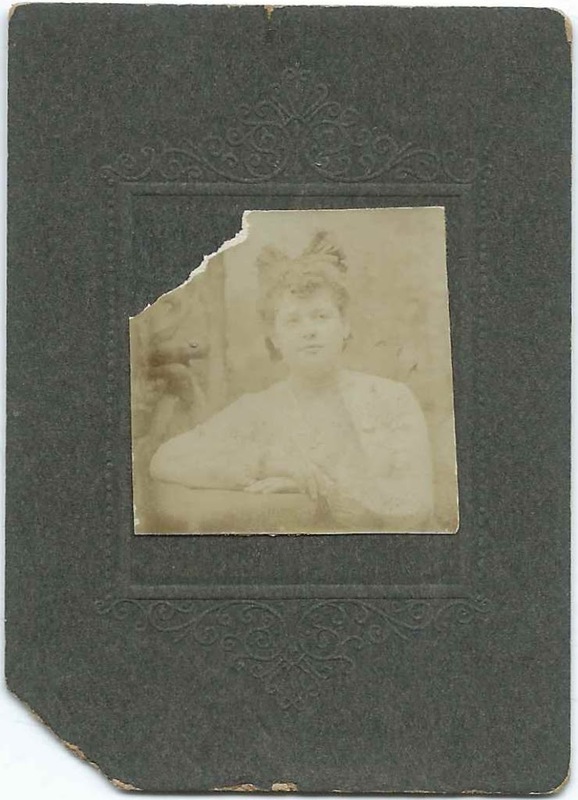 Cabinet photograph of a woman identified on the reverse as Susie M. Bancroft. The photograph was taken by the Worden studio of 48 Winter Street, Boston, Massachusetts. There are several possibilities for a Susie M. Bancroft. 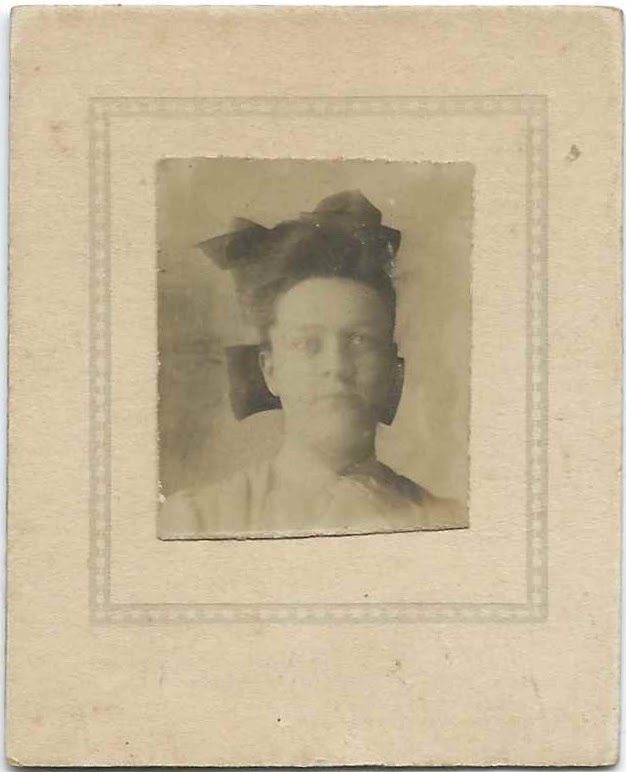 Hopefully a reader will recognize her from family photos and research. One tempting possibility is Susan M. (Bancroft) Richardson, wife of David L. Richardson, whom she married November 29, 1854 at Reading, Massachusetts. That Susan M. Bancroft was born March 18, 1836, the daughter of George Bancroft and Mary (Porter) Bancroft. There was a Susie Maria Bancroft, born February 26, 1868 at Reading, Massachusetts, was born about 1859, daughter of Haskell and Abbie Bancroft. 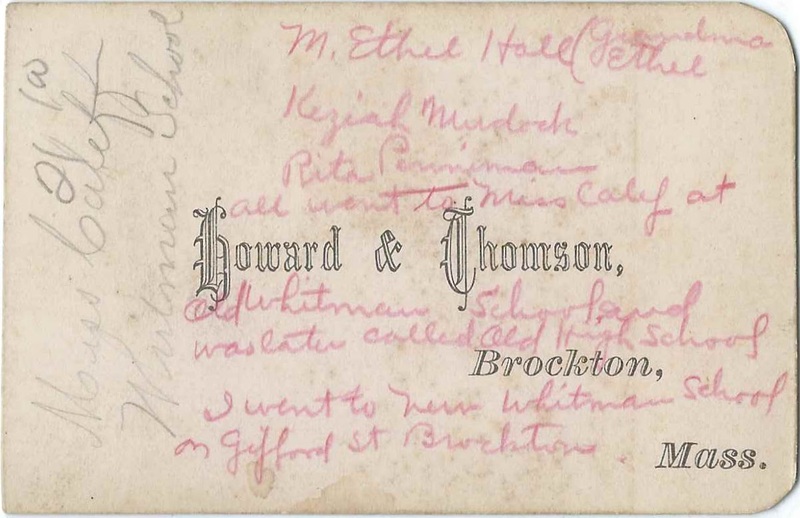 She married Edward A. Hamden on September 12, 1877 at Reading, Massachusetts; and William H. Thresher on April 25, 1894 at Boston, Massachusetts. Though it's unlikely that either of these Susan/Susie possibilities was known as Susie M. Bancroft at the time the photograph was taken, it's possible that she was identified by her maiden name by a family member or friend. 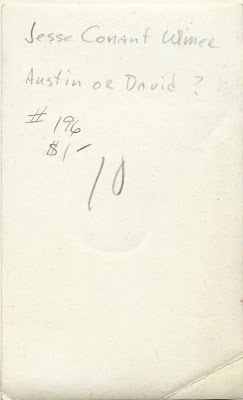 If you have corrections and/or additions to the information above, or a different theory on the identity of Susie M. Bancroft, please leave a comment or contact me directly. 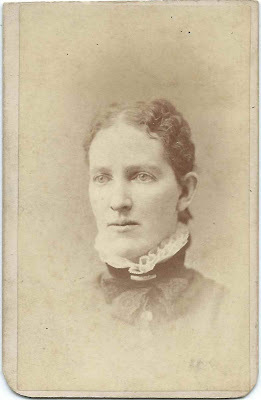 c1890 photograph of a young woman identified on the reverse in contemporary handwriting as Louise Benson of Oakland, Maine, "friend of Merrick's". 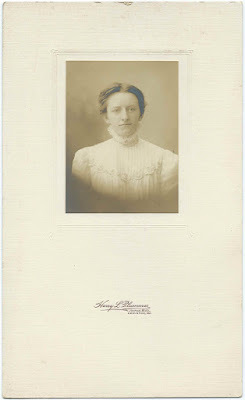 She may have been Louise May Benson, born November 20, 1872, possibly at Waterville, Maine, daughter of George Tyler Benson and Susan Elizabeth (Pollard) Benson. An area in the west of Waterville was set off in 1873 as West Waterville and later renamed Oakland in 1883. The Benson family may have lived in the section that ultimately became Oakland. George Tyler Benson worked as a carriage ironer before enlisting in the Union Army during the Civil War, in which he was at least partially disabled. He later served as Postmaster of Oakland, Maine. Louise attended Colby College in 1896 and 1897. She may have been the Louise M. Benson who was boarding at New York City and working as a stenographer. 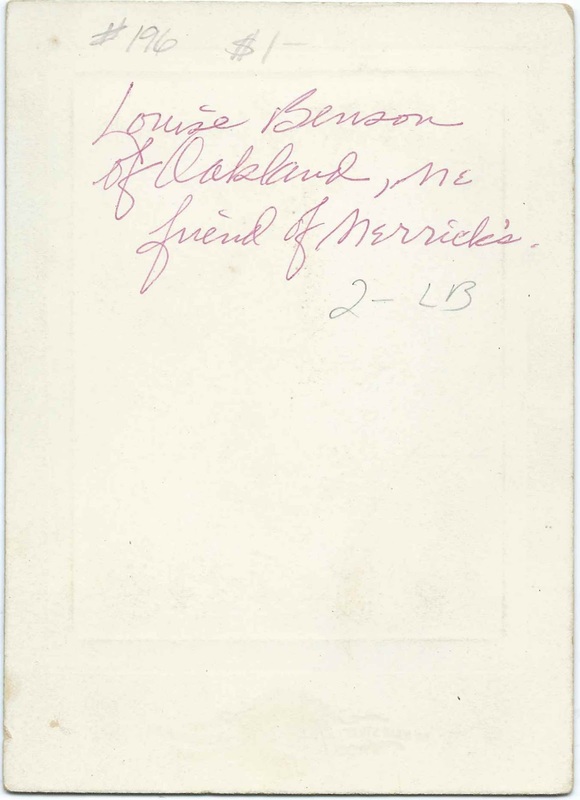 By 1910 Louise was back in Maine, living with her parents at Oakland and working as a typist, with the same situation by the time of the 1920 Census. By 1930, she was still at home with her parents, but with no occupation listed. 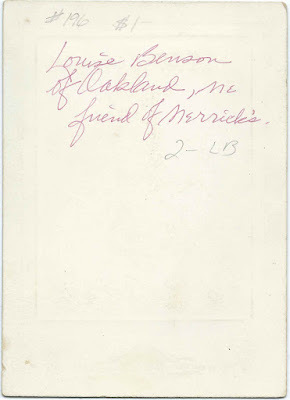 By 1940, Louise's sister, Nellie Shaw (Benson) Wilbur was living with her parents and Louise in the household at Oakland, Maine. Her husband, educator Herbert Lemuel Wilbur, was by then a patient at Foxborough State Hospital at Foxborough, Massachusetts. Louise was living at Pittsfield, Massachusetts, at the time of her death in September 1873. Like Louise, her parents and sister Nellie Shaw (Benson) Wilbur, were all long lived. Circa 1907 Photograph, likely a school photograph, of a young woman identified on the reverse as Mildred Johnson of Brockton, Massachusetts, a student, or recent graduate, of B.H.S., presumably Brockton High School. 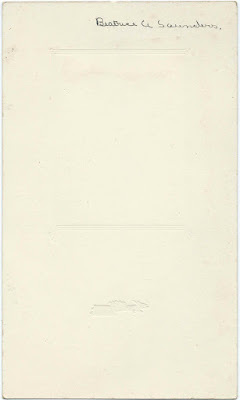 The photograph itself measures approximately 1-1/2" by 1"; the matted piece measures approximately 2-1/2" by 2". 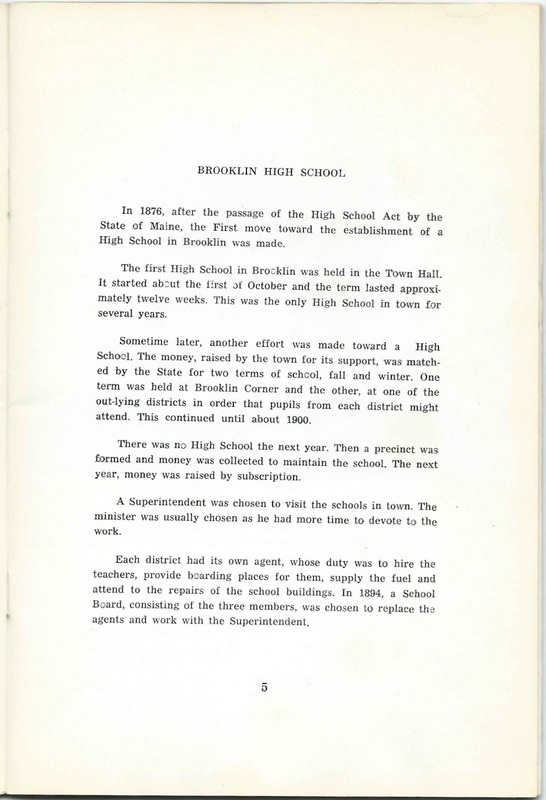 It was found with a collection of other photographs from the Brockton, Massachusetts area. Mildred Ames Johnson was born August 2, 1889 at Brockton, Massachusetts, the daughter of Albert Edward Johnson and Jane A. (Cushman) Johnson. On August 15, 1925 in New York City, Mildred married James Ernest Mann, son of James William Mann and Eliza J. (McNeil) Mann. James was born July 10, 1879 at Salem, Massachusetts. On the World War I draft registration card James Earnest completed in 1918, he indicated he was a traveling salesman for Parker Brothers, Inc., and his home address was 245 Lafayette Street at Salem, Massachusetts. 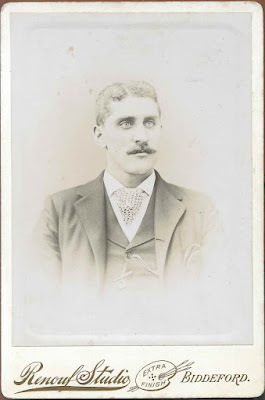 His nearest relative then was his grandmother, Margaret (Luscombe ?) 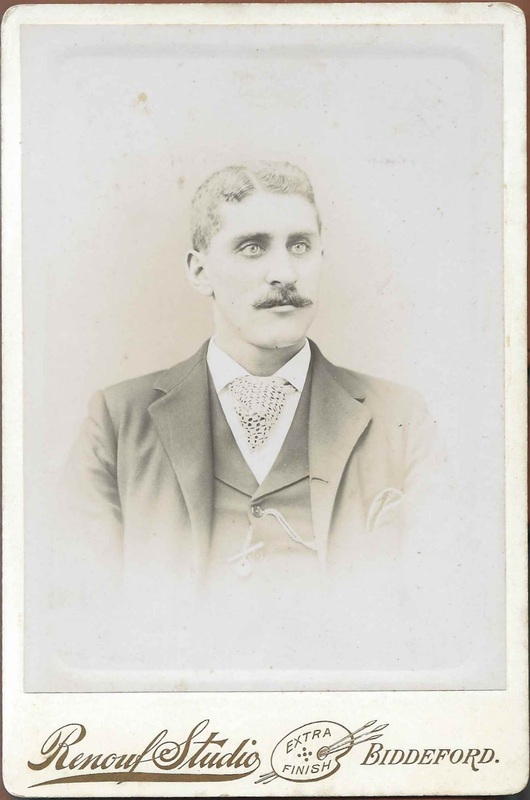 O'Neill, as his parents had both died by 1894. In 1921 he filed a patent for an improvement to a Parker Brothers game. James and Mildred lived at Salem, Massachusetts, where they're listed in city directories from the late 1920s and early to mid 1930s. I don't know if they had children. James died in 1936 and Mildred in 1969. They're buried in Harmony Grove Cemetery at Salem, Massachusetts, with James' brothers and their wives. c1890 carte de visite of Genesta May Rood of Somerville, Massachusetts. The photograph was taken by the L. W. Cook studio of 585 Washington Street, Boston, Massachusetts. 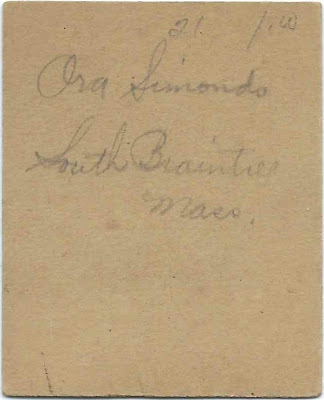 The identification on the reverse as her surname spelled phonetically as Rude. Genesta May Rood was born about November 1885 in Port Hilford, Nova Scotia, in Guysborough County, the daughter of Henry Rood or McRood and Lucinda Grace (Flynn or Hinds) Rood. 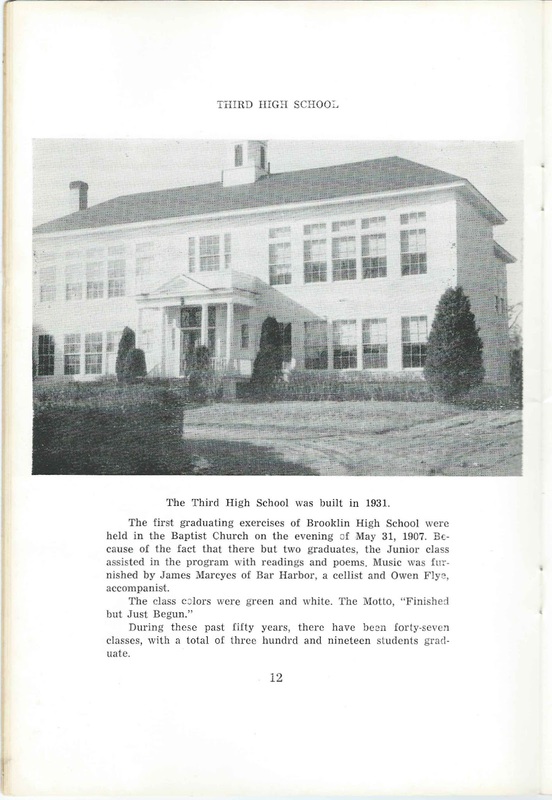 The family moved to Massachusetts about 1887 and settled at Somerville. 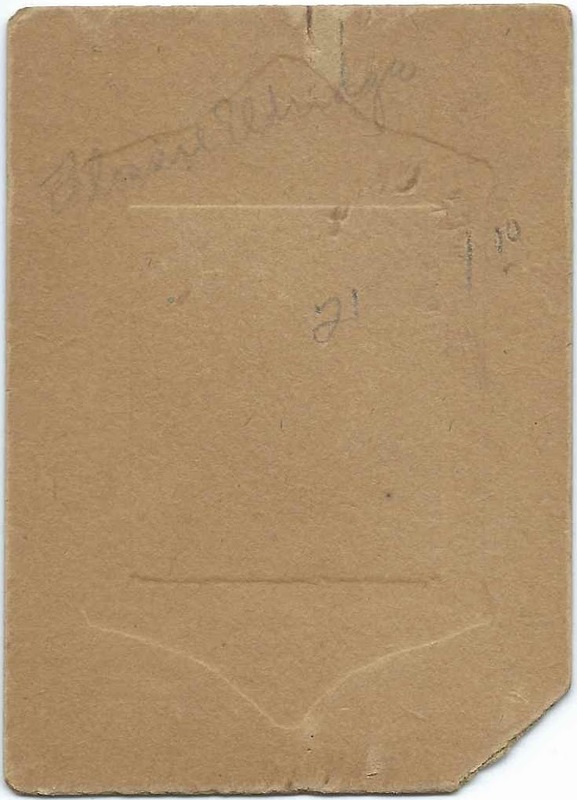 On June 11, 1911 at Somerville, Massachusetts, Genesta married Stanley Elisha Brown, son of Charles Elwin Brown and Harriet W. (Cushman) Brown. Stanley was born October 6, 1888 at Morrill, Maine. Genesta and Stanley lived at Somerville, Massachusetts, and Arlington, Massachusetts, and had at least one child, a son. It appears that Genesta and Stanley retired to the Belfast, Maine area, perhaps to Stanley's nearby childhood hometown of Morrill. Genesta died at Belfast, Maine, in 1967 and Stanley in 1973, also at Belfast. They're buried in Grove Cemetery at Belfast, Maine. Circa 1900 photograph, presumably a school photograph, of a girl identified on the reverse as Ora Simonds of South Braintree, Massachusetts. 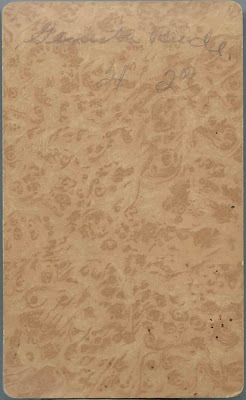 The photograph itself measures approximately 1-1/4" by 1"; the matted piece measures approximately 2-1/2" by 2". It was found with a collection of similar sized photographs of youngsters and young adults, mostly from Brockton, Massachusetts. Ora Autumna Simonds was born November 9, 1890 at Braintree, Massachusetts, the daughter of Henry Willie Simonds and Emily Claribel (Arnold) Simonds. On October 25, 1910 at Braintree, Ora married Myron Austin Haskell, son of Henry A. Haskell and Annie (Butterworth) Haskell. Myron was born at Hyde Park, Massachusetts, on August 4, 1888. 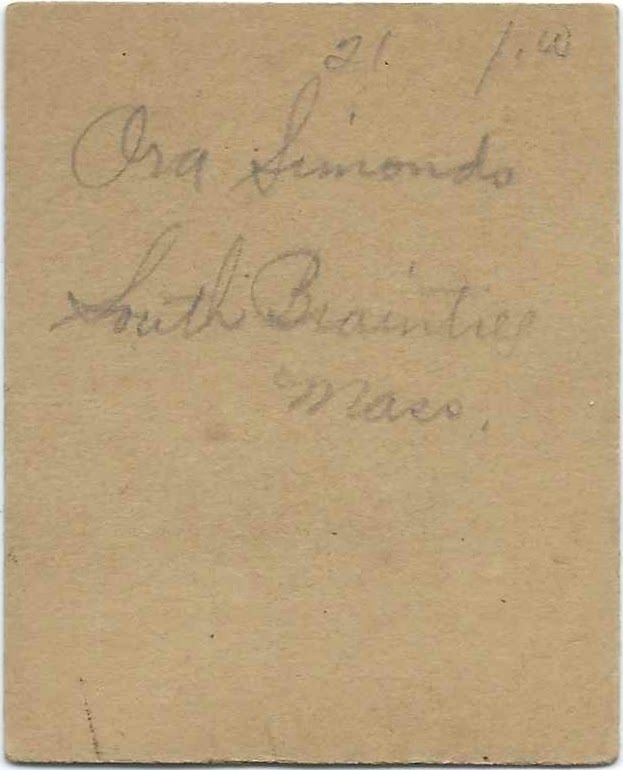 Ora and Myron lived at Braintree, Massachusetts and had, I believe, three sons. Ora died in 1951 in Arizona; Myron died in 1959. They're buried in the Lakeside Cemetery at Braintree, Massachusetts. Circa 1880 photograph of a woman identified on the reverse as "Miss Caleff, Whitman School". 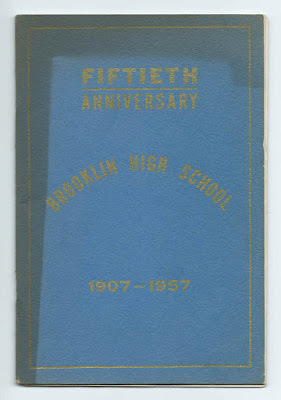 The photograph was taken by the Howard & Thomson studio of Brockton, Massachusetts. She may have been Isabella Calef, a native of Lowell, Massachusetts. 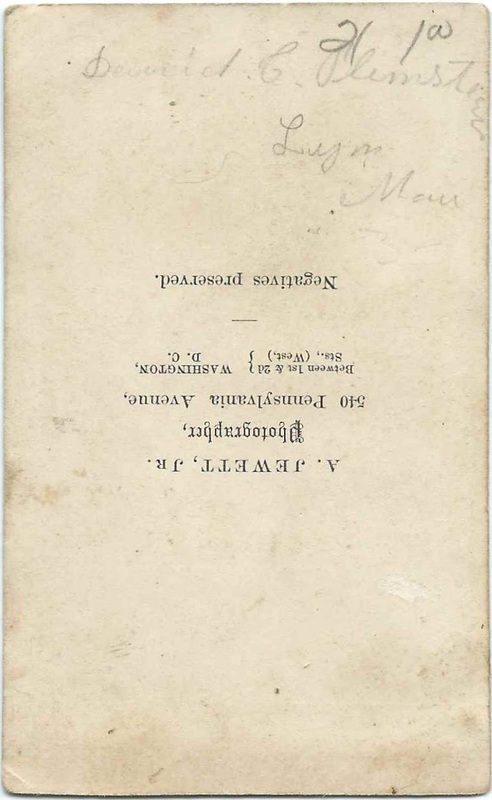 The CDV is especially interesting because it contains additional information, written presumably at a later time, by one of Miss Calef's students who called her Miss Calef, rather than Caleff. Coincidentally, this information ties in with a memorial card I featured in November of 2013, but the items were purchased separately; more information farther below. 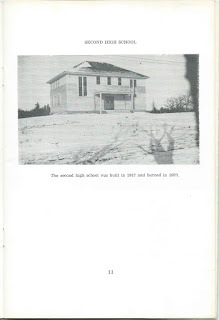 M. Ethel Hall (Grandma Ethel); Keziah Murdock; Rita Penniman; all went to Miss Calef at Old Whitman School and was later called Old High School. I went to New Whitman School on Gilford St Brockton. 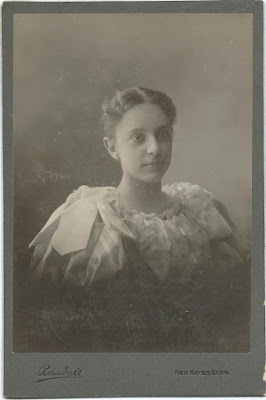 "Grandma Ethel" was Mary Ethel Hall, daughter of Augustus Florentine Hall and Susan Elizabeth (Osborne) Hall and wife of Walter Aldrich Penniman. Ethel and Walter had a daughter, Rita Mildred Penniman, who may be the Rita Penniman named above. 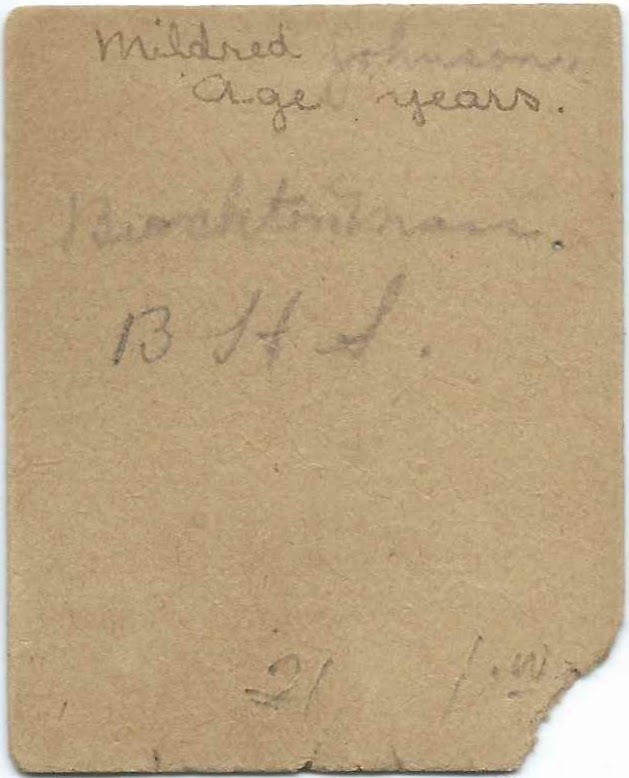 A post from November 2013 features memorial cards of Ethel and her father-in-law William Reed Penniman. After Ethel's death from cancer in 1897, Walter married the above-named Keziah Murdock, who was by then the widow of Everett F. Mank. 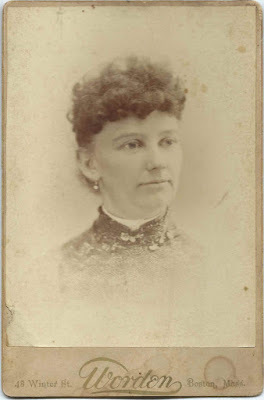 As for Miss Calef, I believe she was Isabella Calef, born March 7, 1847 at Lowell, Massachusetts, daughter of James Calef and Mary Ann (Shattuck) Calef. 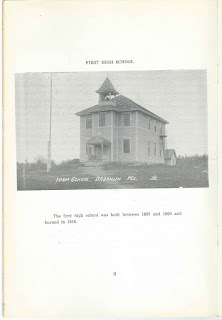 In 1880, a Belle Calef was living at Easton, Massachusetts, and working as a teacher. 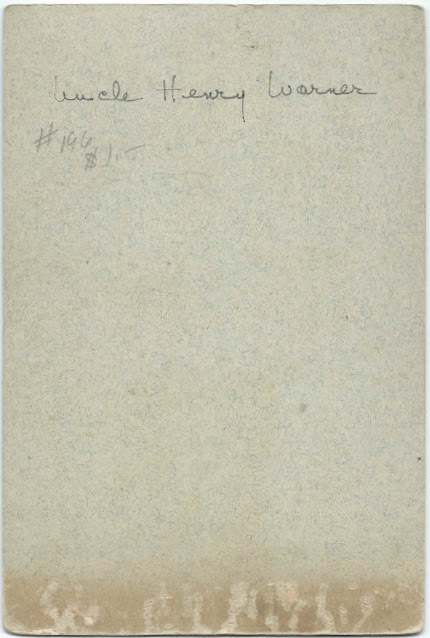 By 1900, Isabella was living in the household of her sister Helen and Helen's husband Charles H. Tilton at Somerville, Massachusetts; no occupation was listed then or in 1910. Sadly, by 1920, she was a patient at the Gordon Home Hospital at Dorchester, Massachusetts, and by 1930 she was at the Boston Home for Incurables. She died in 1933 at Boston, Massachusetts. 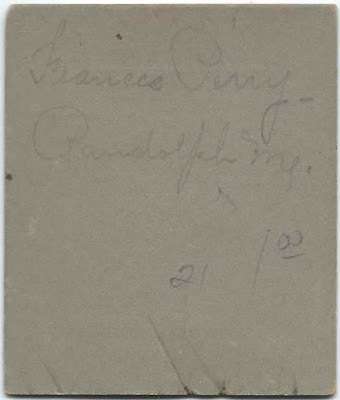 c1910 photograph of Frances Perry of Randolph, Maine; presumably Frances Gertrude Perry. 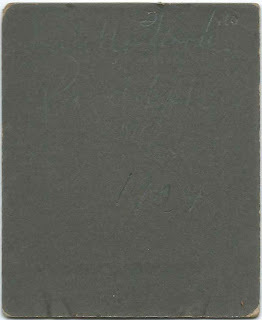 The photograph itself measures approximately 1-1/4" by 1"; matted, the piece measures almost 2-3/4" by 2-1/4". 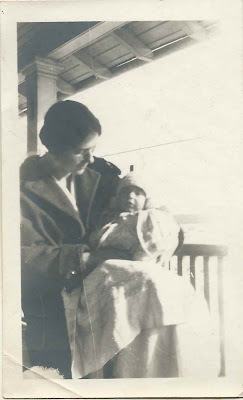 She was mostly likely Frances Gertrude Perry, born June 7, 1892 at Phippsburg, Maine, the daughter of Lester Alton Perry and Albina Augusta (Preble) Perry. In 1916, Frances graduated from the Special Education Course at the Posse Normal School of Gymnastics at Boston, Massachusetts. 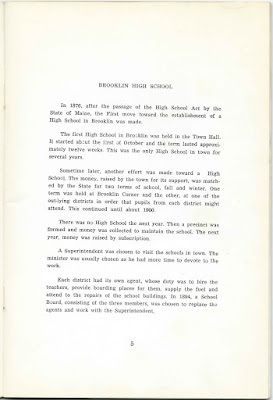 Read more, here, about physical education pioneers Swedish Baron Nils Posse and Baroness Rose Moore (Smith) Posse, a Newburyport, Massachusetts native. 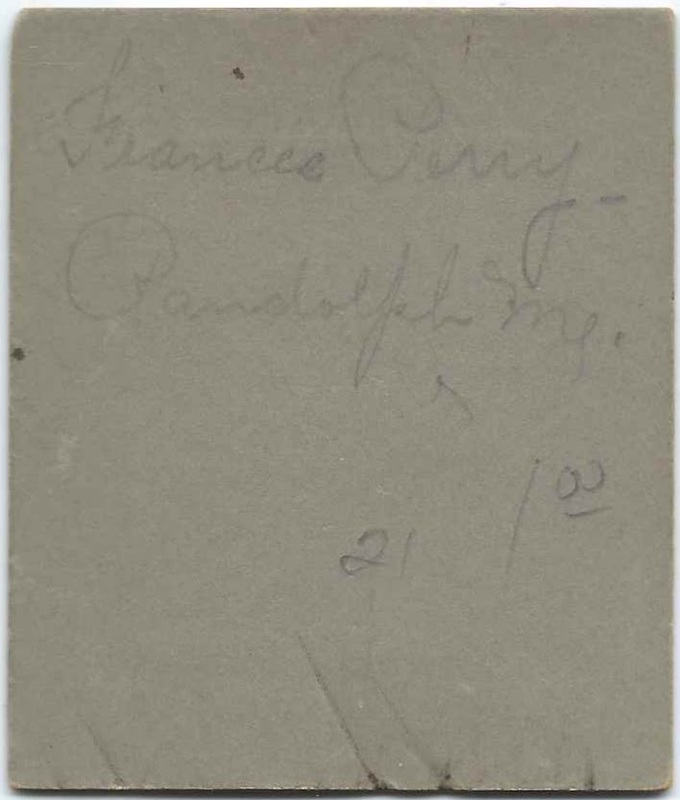 By 1920, Frances was working as a reconstruction aide and living with her parents at Randolph, Maine. She may have been the Frances G. Perry who was living in New York City at the time of the 1940 Census and working as a campaign organizer. 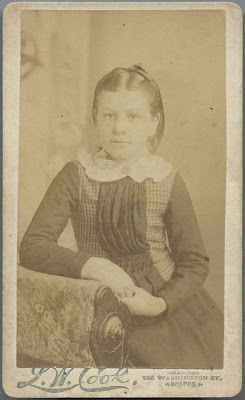 1904 photograph of a young girl identified on the reverse as Isabelle Moore of Randolph, Maine. She was presumably Isabel Merrill Moore. 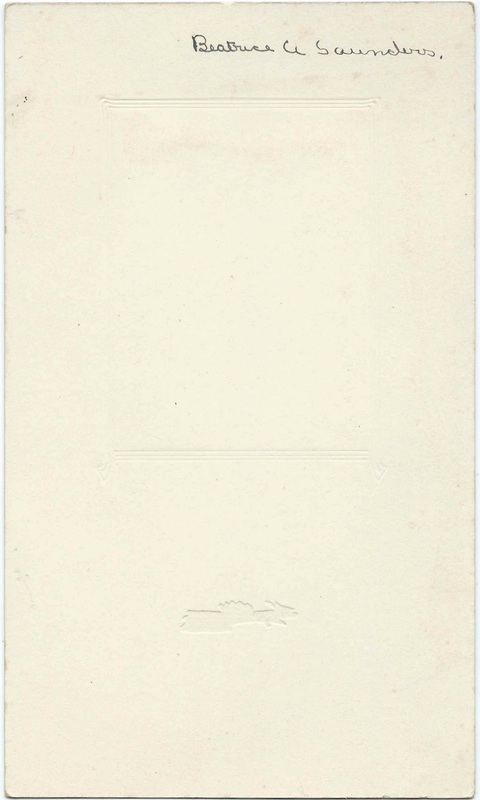 The photograph measures approximately 1'1/4" by 1"; the matted piece is about 2-3/4" by 2-1/4". Isabel Merrill Moore was born March 24, 1900 at Randolph, Maine, the daughter of Warren E. Moore and Ritta (Merrill) Moore. Isabel, judging from a newspaper article, may have attended Radcliffe College at Cambridge, Massachusetts. She became a nurse and was working as a school nurse at Hampton Falls, New Hampshire, when she married farmer Ray Warren Combs on June 27, 1925 at Hampton Falls. Ray was born July 20, 1894 at Hampton Falls, New Hampshire, the son of Charles Frank Combs and Mary Susan (Pevear) Combs. Ray graduated from Hampton Academy in 1910 and the New Hampshire College of Agriculture and the Mechanic Arts in 1914. Isabel and Ray lived at Seabrook, New Hampshire, where they raised several children. Isabel died in 1957, and Ray in 1979. If you have corrections and/or additions to the information above, or if you feel that "Isabelle" is a different person, please leave a comment or contact me directly. 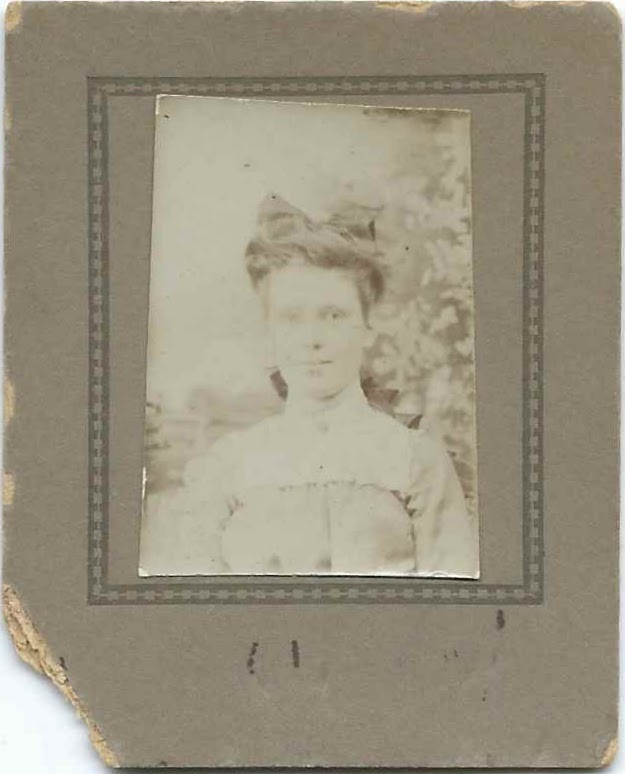 Circa 1905 photograph, possibly a school photograph, of a young woman identified on the reverse as Flossie Eldridge. 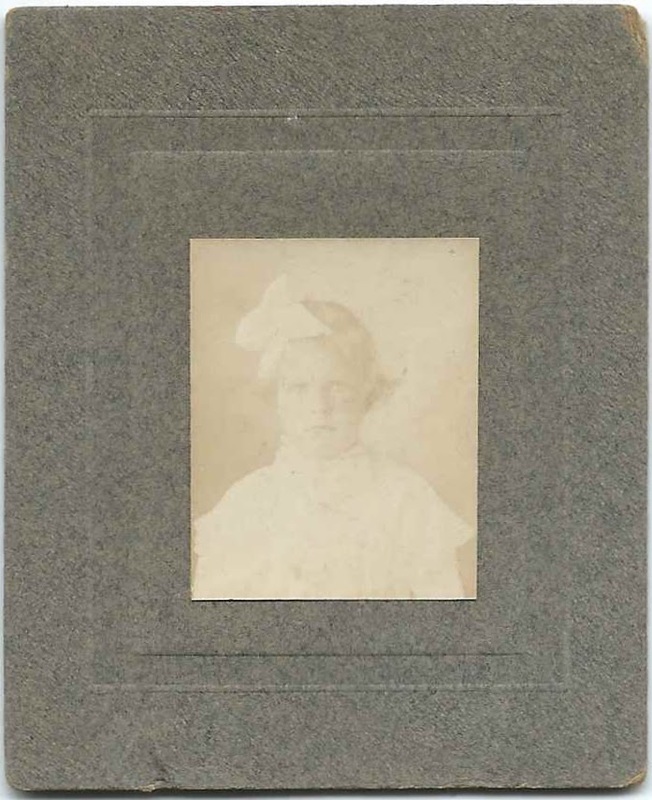 Because the photograph was found with a collection of similar photographs from Brockton, Massachusetts, and area towns, Flossie was likely Flossie Ella Eldridge of Brockton. The photograph itself measures approximately 1-1/4" square; matted, the piece is approximately 3-1/4" by 2-1/4". As noted above, since the photograph was found with similar photographs from Brockton, Massachusetts, I believe Flossie was Flossie Ella Eldridge, born June 9, 1891 at Brockton, the daughter of George W. Eldridge and Addie J. (Spencer) Eldridge, both originally from Maine. 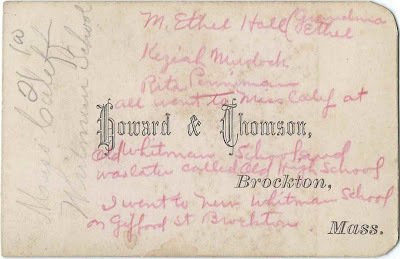 On June 9, 1911 at Brockton, Massachusetts, Flossie married Arthur Elwin Skinner, son of George Washington Skinner and Carrie Eliza (Dickinson) Skinner of Vermont. Flossie and Arthur lived at Brockton, Massachusetts, and had, I believe, three children. Flossie died in 1953 and Arthur in 1963. They're buried in the Melrose Cemetery at Brockton, Massachusetts. If you have corrections and/or additions to the information above, or you feel that Flossie is another person entirely, please leave a comment or contact me directly.